The earliest use of the geṭ, an institution peculiar to the Jews, can not be established with certainty. Although the suggestion of the Rabbis that it has existed among the Jews since the time of Abraham (Yalḳ. Shime'oni, i. 95) may be regarded as fanciful, yet in Deut. xxiv. 1-4 the geṭ is spoken of as being well known to the people. The complexity of the system of procedure in the writing and the delivery of the geṭ is, however, of much later origin. Even in the times of the Mishnah, the form seems to have been very simple, requiring, besides the date, place, and the names of the parties, the phrase "Thou art free to any man" (Giṭ 85b). It was later, in the Babylonian schools, that the minute details in the preparation of the geṭ were established, and its form and phraseology fixed. These minute regulations were intended to diminish mistakes and misunderstandings; for only such men were able to prepare the geṭ as were well versed in the Law and were familiar with Jewish institutions (Ḳid. 13a). "On the . . . day of the week, the . . . day of the month of . . . in the year . . . since the creation of the world, according to the numbering we are accustomed to regard here in the town of . . . (which is also called . . .), which is situated on the river . . . , and contains wells of water, I, . . . (who am also called . . . ), the son of . . . (who is also called . . .), who am this day in . . . (which is also called . . .), the city situated on the river . . . and containing wells of water, do hereby consent with my own will, being under no restraint, and I do release, send away, and put aside thee, my wife, . . . (who is also called . . . ), daughter of . . . (who is also called . . .), who art this day in . . . (which is also called . . .), the city situated on the river . . . and containing wells of water, who hast been my wife from time past; and thus I do release thee, and send thee away and put thee aside, that thou mayest have permission and control over thyself to go to be married to any man that thou mayest desire; and no man shall hinder thee from this day forever, and thou art permitted to any man, and this shall be unto thee from me a bill of dismissal, a document of release, and a letter of freedom, according to the law of Moses and Israel. ". . . the son of. . . , witness. . . . the son of. . . , witness." 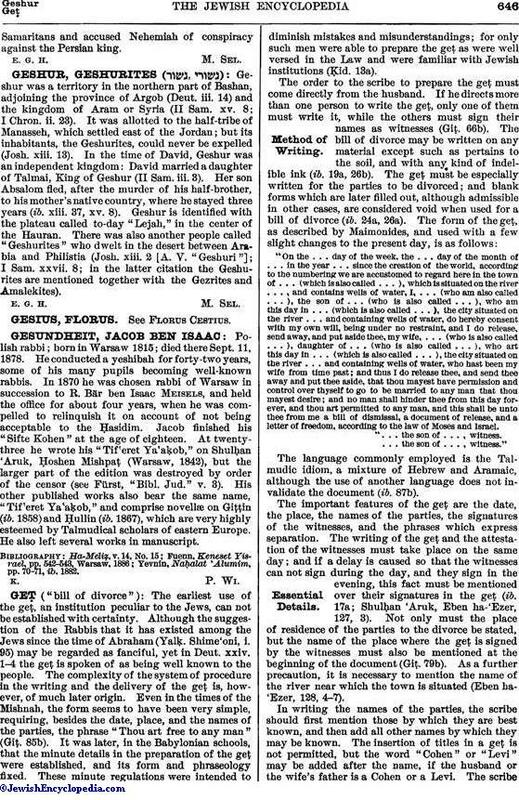 The language commonly employed is the Talmudic idiom, a mixture of Hebrew and Aramaic, although the use of another language does not invalidate the document (ib. 87b). The important features of the geṭ are the date, the place, the names of the parties, the signatures of the witnesses, and the phrases which express separation. The writing of the geṭ and the attestation of the witnesses must take place on the same day; and if a delay is caused so that the witnesses can not sign during the day, and they sign in the evening, this fact must be mentioned over their signatures in the geṭ (ib. 17a; Shulḥan 'Aruk, Eben ha-'Ezer, 127, 3). Not only must the place of residence of the parties to the divorce be stated, but the name of the place where the geḥ is signed by the witnesses must also be mentioned at the beginning of the document (Giḥ. 79b). As a further precaution, it is necessary to mention the name of the river near which the town is situated (Eben ha-'Ezer, 128, 4-7). In writing the names of the parties, the scribe should first mention those by which they are best known, and then add all other names by which they may be known. The insertion of titles in a geṭ is not permitted, but the word "Cohen" or "Levi" may be added after the name, if the husband or the wife's father is a Cohen or a Levi. The scribemust be very careful to spell correctly the names of the parties. Lists of names of men and of women with their correct spellings were prepared by various rabbis from time to time and served as guides to the scribe (ib. 129). The signatures of the witnesses have three elements-the prænomen, the patronymic, and the word "'ed" (witness)—any two of which are sufficient to make the geṭ valid (Giṭ. 87b; see Attestation of Documents). The most essential part of the geṭ is the expression "Thou art permitted to any man" (ib. 85a). If the husband restricts his wife from marrying after she has been divorced from him, the geṭ is not valid (ib. 82a). The geṭ itself must contain no condition, although the husband may impose certain conditions upon the wife at its delivery (ib. 84b). Conditions then imposed have to be strictly fulfilled by the wife in order that the geṭ may become valid. The death of the husband may be made a condition, in which case the language of the condition must be retrospective; that is, he must say "This will be thy bill of divorce from now on ["me'akshaw"] if I die"; and if he dies she is considered divorced from the time the geṭ is delivered to her (ib. 72a; see Conditions). After the geṭ has been written and signed by the witnesses, it is given to the rabbi, who together with the witnesses must read and examine it carefully to see that there is no error in spelling. (It is recommended that a correct copy of a geṭ be in the possession of the rabbi, for the purpose of comparison with any later geṭ.) The rabbi then questions the scribe whether he wrote the geṭ at the request of the husband; and the witnesses are then questioned in the same manner. Then the geṭ is given to the husband, who is asked whether he ordered it of his own free will. The husband then repeats the declaration which he had made before the geṭ was written; namely, that he has not raised and will not raise any protest against the validity of the geṭ, and that he has not been constrained by any one to give the geṭ to his wife, but that he does so all of his own free will. If the husband wishes to leave the room before the delivery of the geṭ, he is sworn not to raise any protest which may invalidate the proceedings. Then comes the last stage in the proceedings, the delivery of the geṭ to the woman. It is customary to assemble ten men, including the rabbi, the witnesses, and the scribe, to act as witnesses to the delivery. The rabbi then addresses them as follows: "If there is any man here who knows aught to invalidate the geṭ, let him come forth and state his protest now; for after the delivery the ban of excommunication will be pronounced upon any one who will attempt to invalidate the geṭ." The woman is then told to remove any rings she may have upon her fingers, and to spread out her hands to receive the geṭ, which the husband places in her hands, saying: "This is thy bill of divorce, and thou art divorced from me by it, and thou art permitted to any man." She then closes her hands and lifts them up with the geṭ in them, and then the rabbi takes it away from her and reads it a second time with the witnesses, and pronounces the ban of excommunication upon any one who may attempt to invalidate it. Then he tears it crosswise and keeps it with him for future reference. While this is the regular procedure in the delivery of the geṭ, it is not essential that the geṭ should be placed in the hands of the woman. It is sufficient to place it in her possession or within her reach to constitute a divorce (ib. 77a). The woman, however, must have a knowledge of its nature and contents; and if the husband tells her that it is a document or a bond, or if he puts it in her lap while she is asleep, she is not divorced (ib. 78a). If the woman is so young that she does not understand the nature of the geṭ, she may not be divorced (ib. 64b). The geṭ may also be delivered to the woman through a messenger; and all the laws of delivery apply with equal force to the messenger and to the woman herself. The messenger may be appointed either by the wife or by the husband, and, in accordance with the Talmudic principle that "a man's agent has the same powers as the principal" (see Agency, Law of), in either case the messenger is possessed of all the prerogatives of the principal. Three kinds of messengers are recognized by the Rabbis with regard to divorce: (1) a messenger appointed by the husband to take the geṭ. to his wife ("holakah"), when the geṭ goes into force only after it reaches her; (2) a messenger appointed by the wife to receive the geṭ from her husband ("ḳabbalah"), when she becomes divorced as soon as the geṭ is delivered to the messenger; and (3) a messenger appointed by the woman to bring the geṭ to her("haba'ah"), in which case she becomes divorced only after the geṭ has been given to her (ib. 62b). All persons except deaf-mutes, idiots, minors, the blind, the heathen, and slaves are eligible to act as messengers in cases of divorce (ib. 23b). The messenger who conveys a geṭ from the husband to the wife, from Palestine to a foreign country, or vice versa, or from one place to another outside of Palestine, must pronounce the following testimony: "In my presence it was written and in my presence it was signed"; and if he can not testify to that effect, the signature of the witnesses must be authenticated (ib. 2a; see Authentication of Documents; Evidence). Such a messenger, therefore, may not appoint a submessenger when he himself is unable to execute his mission. If he falls sick on the way, and can not proceed to his destination, he must deposit the geṭ with the court of the town and must deliver his testimony before it; and the court then appoints a messenger to deliver it to the woman. This messenger is merely obliged to announce himself as the messenger of the court; for it is presumed that the court executed the matter properly (ib. 29b). Concerning the presumption of life with regard to the husband, see ḤazaḲah. See also Deaf and Dumb in Jewish Law; Deeds; Divorce (illustrated); Insanity; Ketubah; Majority. 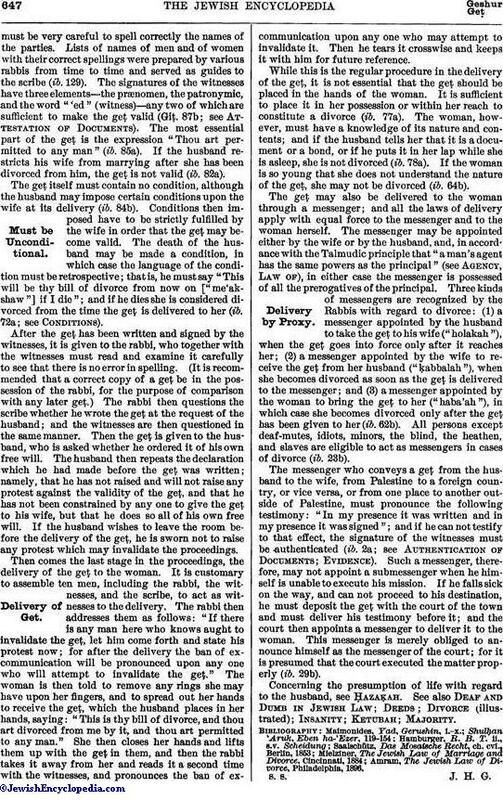 Amram, The, Jewish Law of Divorce, Philadelphia, 1896.